The BFI is bringing 80s smash hit 9 to 5 back to the big screen this autumn. Hilariously tackling issues that almost 40 years later are finally being taken seriously in the age of #MeToo, the film stars Jane Fonda, Lily Tomlin and Dolly Parton as workmates who take matters into their own hands, and refuse to put up with their sexist boss‘s behaviour. 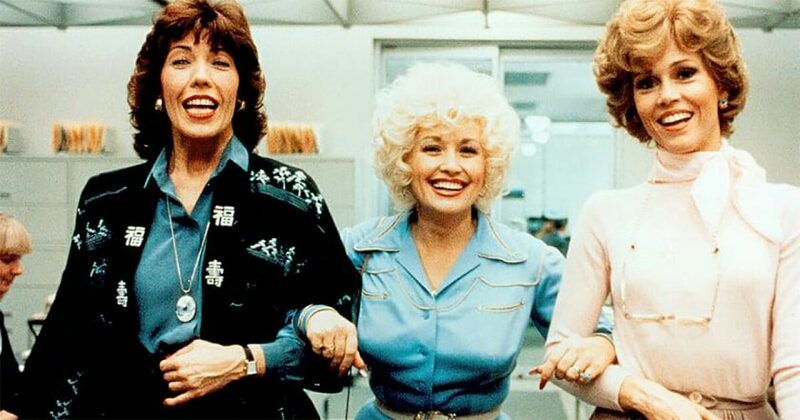 9 to 5, which features the iconic title song by star Dolly Parton, is an inspiring story about female friendship which was decades ahead of its time, and is ripe for rediscovery by a whole new generation of film lovers. The film is the centrepiece of the BFI’s forthcoming blockbuster season of film and TV comedy, Comedy Genius (22 October 2018 – 31 January 2019), and will be previewed at BFI Southbank on 23 October with Jane Fonda in Conversation, where she will discuss her career, the film, and plans for the recently announced sequel, which is now in development. Directed by Colin Higgins (Foul Play, The Best Little Whorehouse in Texas), 9 to 5 was based on an idea by Jane Fonda, who had her own production company and wanted to make a film about clerical workers; a film with a political message about the inequalities in the workplace but couched through comedy. The idea was turned into a story by Patricia Resnick, with the screenplay written by director Colin Higgins and Patricia Resnick. 9 to 5 is the story of three women at work who are sick of their “sexist, egotistical, lying, hypocritical bigot” boss, and want to change their all-female workplace for good. Judy (Fonda), Violet (Tomlin) and Doralee (Parton) couldn’t be more different from each other, but they make friends over being mistreated by their sleazy boss, Franklin Hart, Jr. (Dabney Coleman): he yells at newly-divorced Judy on her first day in an office, consistently takes credit for supervisor Violet’s smart ideas and sexually harasses his secretary Doralee. Fed up with him, and the sexist practices of their offices, they dream of getting rid of him for good and join forces to hatch a plan. This BFI re-release offers a perfect opportunity to revisit, or discover for the first time, this classic feminist comedy. Although to digital natives the pre-technological office setting seems like a very long time ago, the issues raised in 9 to 5 are sadly just as relevant today, almost 40 years later, and, as the #MeToo and Time’s Up movements have shown, are still being fought by working women everywhere. In July, while taking part in the US Television Critics Association panel about her forthcoming HBO documentary, Jane Fonda in Five Acts, Fonda confirmed that a sequel of 9 to 5 is in the works. The plan is to follow the original and deal with today’s workplace problems, again with a dynamic group of powerful female characters. If that changes then “I’m not going to be in it” she said, “but right now, Dolly, Lily and I are all intending to be in it.” Fonda will also be executive producer and is already in discussion with the writers. Among current issues that have caught her eye is the out-sourcing of recruitment, leaving employees unsure of who to turn to when they need help, and how social media can enable spying by employers. “I’m sorry to say that the situation is worse today,” she commented. 9 to 5 was a huge hit in the USA where it was the second-highest grossing film of 1980, coming in only behind The Empire Strikes Back. Dolly Parton wrote and performed the title song, which won her an Oscar nomination and remains her third biggest UK hit single. The film has strongly endured with a spin-off TV series (running 1982-88) and more recently a musical production. Having toured the UK, 9 to 5 The Musical, with music and lyrics by Dolly Parton, will open at the Savoy Theatre, London on 28 January 2019, starring Louise Redknapp, Amber Davies, Natalie McQueen and Brian Conley. Alongside Comedy Genuis, BFI Southbank will host a dedicated Jane Fonda season (22 October – 31 December), including screenings of films such as Klute (Alan J Pakula, 1971), Barbarella (Roger Vadim, 1968) and Coming Home (Hal Ashby, 1978).